Cody, a cherished GoldHeart Long Term Foster (LTF) and member of the Webb family, crossed over the Rainbow Bridge September 3, 2014. He was closing in on 14 years old and was a sweet gentle soul, who loved his foster family beyond words. 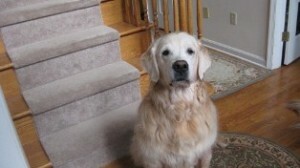 RIP dear Cody, you are now without pain…run free and play hard!